The Senate of the Republic (Italian: Senato della Repubblica) or Senate (Italian: Senato) is a house of the bicameral Italian Parliament (the other being the Chamber of Deputies). The two houses together form a perfect bicameral system, meaning they perform identical functions, but do so separately. 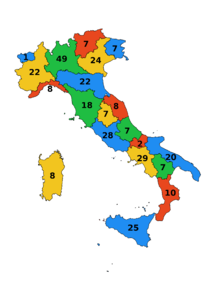 Pursuant to Articles 57, 58, and 59 of the Italian Constitution, the Senate has a variable number of members, of which 309 are elected from Italian constituencies, 6 from Italian citizens living abroad, and a small number (currently 6) are senators for life (senatori a vita), either appointed or ex officio. It was established in its current form on 8 May 1948, but previously existed during the Kingdom of Italy as Senato del Regno (Senate of the Kingdom), itself a continuation of the Senato Subalpino (Subalpine Senate) of Sardinia established on 8 May 1848. Members of the Senate are styled Senator or The Honourable Senator (Italian: Onorevole Senatore) and they meet at Palazzo Madama, Rome. The Senate consists of 315 elected members, and as of 2018[update] six senators for life. The elected senators must be over 40 years of age and are elected by Italian citizens aged 25 or older. In 2016, Italian Parliament passed a constitutional law that "effectively abolishes the Senate as an elected chamber and sharply restricts its ability to veto legislation". The law was rejected on December 4, 2016 by a referendum, leaving the Senate unchanged. According to article 58 of the Italian constitution, people aged more than 25 years are enabled to vote for the Senate. In addition to overseeing the business of the chamber, chairing and regulating debates, deciding whether motions and bills are admissible, representing the Senate, etc., the President of the Senate stands in for the President of the Republic when the latter is unable to perform the duties of the office; in this case the Senate is headed by a vice president. ^ "Berlusconi allies hit out over president's lifetime senator snub". Financial Times. 30 August 2013. Retrieved 5 September 2013. ^ "senato.it - Scheda di attività di Giorgio NAPOLITANO - XVII Legislatura". www.senato.it. ^ "senato.it - Scheda di attività di Mario MONTI - XVII Legislatura". www.senato.it. ^ "senato.it - Scheda di attività di Elena CATTANEO - XVII Legislatura". www.senato.it. ^ "senato.it - Scheda di attività di Renzo PIANO - XVII Legislatura". www.senato.it. ^ "senato.it - Scheda di attività di Carlo RUBBIA - XVII Legislatura". www.senato.it. ^ "senato.it - Scheda di attività di Liliana SEGRE - XVII Legislatura". www.senato.it. ^ "Italy passes Renzi's flagship reform, opening way for referendum". Reuters. 2016-04-12. Retrieved 2018-03-07. ^ "Constitute". www.constituteproject.org. Retrieved 2018-07-12. ^ (in Italian)G. Buonomo - M. Consentino, Il Vicario del Presidente nelle Assemblee parlamentari con particolare riferimento al Senato della Repubblica italiana, in Il Parlamento, n. 10.12/1999, p. 24-37}. Wikimedia Commons has media related to Senate of the Republic (Italy).